Blackbytes Escrow Exchange Bot (BEEB) is offering you 1,000,000 Bytes now! Dont' try to make fools of us. You generous give away is worth 0,30 USD. Don't grab it if you beleive it does not deserve a finger effort. I am not fooling nobody, I did not promise you a fortune. I have given away 1MB (and someone has grabbed them). "This textcoin was already claimed"
Splendid new features. I hope that this will lead to increased attention for this project. Once I send it, it is a transaction on the dag. It's not claimable until it is confirmed. So, it takes less than 10 minutes prior to be it redeemable. Once it's confirmed and claimed you get the response you got. People are quick to claim free coins. Who needs more distribution rounds if we have Michail? i was able to solve my problem. but it was a long way. 1. i restored to the last wallet before i updated to v2. i used my backup. 2. i restored the byteball folder in application support from the backup too. 3. after i started wallet version Version 1.11.3 (1.11.3) i had a confirmed balance. 4. i updated to Version 2.0.0 (2.0.0) again. 5. now all transactions are confirmed. all the transactions that where unconfirmed just disappeared. and during this try an error process i lost some bytes because i forgot to backup once. i don't know why this happened. maybe because i switched hubs. but i found out about the cash back witness yesterday too. You did not have to go through that whole process, and you have NOT lost bytes; however, you might simply not be able to see them yet. The issue for me is that I would have to go through your wallet to find what happened or where it is. Example.... You might have made a payment from address1 to me, but the change went to address2. When you did a restore prior to the transaction, it only knows of address1 which HAD. When it sync, it sees there is now nothing in address1, but doesn't check address2 since it doesn't know about it (YET). This is a common problem. So, what you can do is make a few payments to someone else or to a new wallet (not full amounts), so that the change will come back. This activates the next address. Your wallet will then calculate the change you just made and the amount that is in there. Long story, but you did NOT lose bytes. You simply may not see them yet. It's also possible you simply thought you had more than you did. There was a discussion about this yesterday in #announcements channel on slack, for anyone interested. Its hard to get into slack, the link in the first post still doesn't work. Most Byteball users are not in the slack, but I think a majority would welcome a unit change. I am so happy that the slack requires the minimal effort of requesting a link in order to stop the spammers. I have left many slack channels just to get away from the spam. If you want into the slack channel, I'm not sure how to say this nicely --- Why didn't you request an invite? You could send me your email address and I can send you an invite link. I think you just made a fool of yourself. Your poor lack of future insight was the same problem people had 7 years ago. I used to give 1 and 5 bitcoin paper wallets all the time. Literally, I gave away hundreds of bitcoin. Be careful, someone will write a bot scraper that will immediately claim any textcoin publicly posted. Well spoken. Here is an other MB for anybody wants it! wow! just when I'd thought I'd heard it all with these lost bitcoin stories....That UPS one! omg...smh!!! great lesson and thanks for sharing my friend! I want to see this new byteball wallet on my notebook. Too bad it's being serviced in warranty right now. About how much time is needed to sync from scratch nowadays(to SSD)? Also, I have a full backup from october, I assume this can accelerate things. Good points, I agree with all of them. I also agree with these points. There are so many factors which are necessary for the success of a coin, and even though en excellent tech and a large adoption base (see Metcalfe's law) surely are main factors, there are many others as the crypto echosystem is becoming more and more complex. Marketing is so important nowadays. And Synergy between all the necessary competences is necessary. More HQ level people have to join the team and my feeling is that part of the still to be distributed Bytes should be destined to them and to all the people who will help. It allows to send Bytes by email or via chat apps. 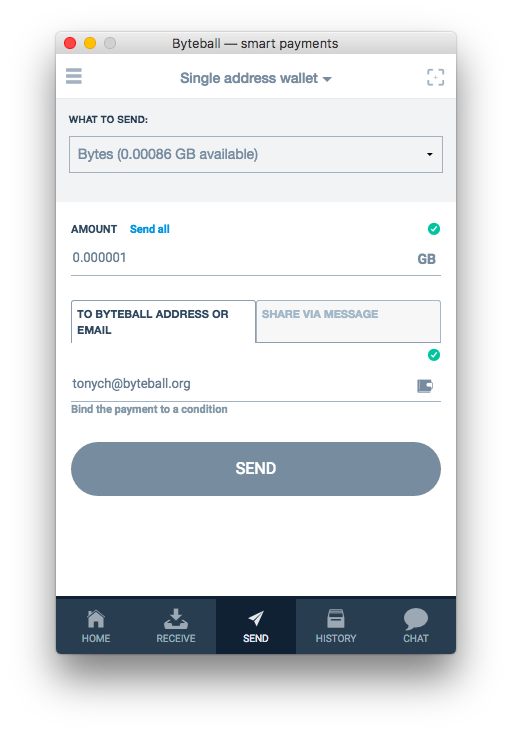 Even if the recipient is not in Byteball yet. I guess most of the people didn't really grasp its implications, otherwise the price would already be 10X. I am SURE there are people I gave bitcoins that which are lost and they don't want to tell me. My cousin sold his 2 months ago, because the amount trippled. Had he sold it today, it would have been a 10 times increase. At least he didn't lose it. I gave another family friend 3 BTC (It was $1000) worth. He put it on blockchain.info but can't remember the password. He's actually had people try crackers on it. So, not lost, just simply stuck there until a password can be figured out. This many years later, and I doubt he will ever see it. Use a light wallet. Takes like 15 seconds. Ahh, but let them. I don't care who gets it. And, people in the thread are more likely to get it than a scraper finder it. Plus, a scraper might be so fast to find it that it gets an error since the code isn't immediately redeemable since the transaction has to be confirmed before it can be redeemed. So, the code is not available for about 5 mins after I post it. I completely agree. Awesome update. I confess I am also hunting a link. Not for the money, but just to see it work. Penny grabbing is a new sport of this community? Try to find yourself on this video. But for blackbytes I would need to load the full chain. Or am I wrong? Agree with the unit change to MB. 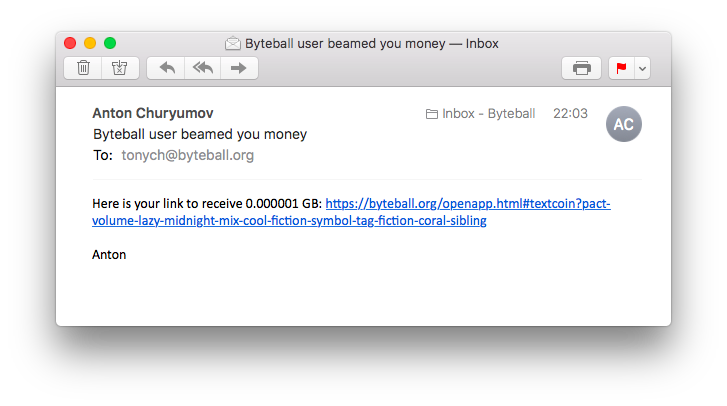 I think the leading zeros argument by Tony just doesn't hold (and if we go by that argument, 0.001GB or 0.0001GB give aways for cashbacks, via emails are just as confusing!). If we want real world adoption and easy to understand units (along with attracting some of the newer crypto adopters), we should switch to MB (and perhaps to KB at a later time). People who trade are careful enough to calculate the amounts before they trade, and aren't concerned about the leading zeros. And there are good examples - IOTA, Ripple, that have leading zeros and are still doing well. Since majority of the community sees this as a much needed move, lets switch to MBs, or better yet, put this up for vote via the poll bot! Tony's argument for many things is weird. Like its a good idea to give most of the minting to competing projects for btc they don;t even own. Luckily Tony is a genius designer and coder so we can forgive these (by comparison) minor errors. Come on let's get it into megabytes right away. I can't take more PM's telling me I must be insane telling them that 250 bucks is less than 5 bucks and they can and do check things out for themselves before jumping in. Of course if it means all the noob investment goes to the cheaper 11BN projects because their exchange unit value is cheaper then that's fine. Tony should listen to the community sometimes it would serve this project and him well. Like any serious investor does not look at the btc value when conducting orders on an exchange, and extra zero is not going to go unnoticed. Penny? I've been giving away $.33 to $2.00 all around the place. Just like I did many years ago with bitcoin. These pennies could be worth hundreds later. Yup, just a penny grab for now. In that video, I'm the black chick on the right. Wrong. Lite clients can use bytes and black bytes the same as full nodes. why the spike in the price lately?? there was some development goal achieved, or just a unlogical common pump?? Probably because of the ability to email and text the Bytes at will. I consider it a major upgrade / feature.